To anyone studying or working in home decor, learning about trends in interior decorating is one of the most exciting parts of life. And it should be, aside from work, the home is where we spend the bulk of our time, and like clothing it needs to be a reflection of us. Style Bust searches the web for the latest and greatest trends for the home; our hope is that you can use some of our findings in the environment you’ve created at home! The military look first appeared as a fashion statement during the Gulf War. In support of troops, guys started wearing camo everything; from underwear to t-shirts, the world was awash with the look of camo. It took (of course) the women to show them how it’s done, and today the infantry look has expanded into an array of styles, colors and designs. In the last few years, the khaki jacket has become a mainstay for the celebrity to grab-and-go out. But, not everyone seems to have it down when it comes to how to wear the jacket. If worn with the wrong top, it can look frumpy. But if worn a bit oversized, with the right top, it can fit the bill. 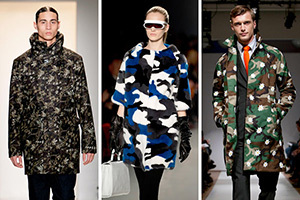 Matching the right colors for the military fashion statement is fairly easy. Start with one piece that will be the main focus, or anchor piece. This is typically the most vibrant pattern in dark or light tones of khaki or green. Add the other pieces in neutral tones of champagne, white, black or even gray. The real appeal about infantry styling is that you can mix and match some of the hottest colors like cinnamon or poppy red and they will be your anchor piece. It’s hard to say when the tank top became an actual single item to wear as a wardrobe choice. Maybe it was part of the beachwear explosion or influenced by the Madonna era. But slowly, the tank top is the choice of almost everyone and represents summer fun and excitement. The tank has become an essential commodity. With its incredible flexibility of wearing alone or in layers, it has evolved from the lowly top into a complete wardrobe must have. Tanks today are in so many colors and styles that they are compared to the evolution of the t-shirt. The shades and tones that are the hottest for this year start out with the pastels and girly-girl looks. These are fantastic as stand alone wear or can be worn with your favorite bikini. But the story doesn’t stop there, the tank has been elevated into a total look with the newest hot colors. Summer brings greens, pale yellows, apricots, persimmon, blues and purples. Color combinations of reds and cinnamon are for the adventurous, but there is also a natural girl look that includes neutral tones and the desert colors of khaki, tan, brown, off-white and champagne. There is a perfect jumpsuit for every look and today’s colors bring a selection from the demure to the outrageous. With summer comes the shorter appeal for every day, and evening brings the sultry style with strapless creations that show off the tan. The jumpsuit was catapulted into popularity in the sixties with the famous British television show, The Avengers. The incredible wit, charm and intellect of Mrs. Emma Peal, brought the show to the forefront. Her incredible array of jumpsuits made it easy for her to take out the bad guys with her martial arts agility. Thanks to that show, the jumpsuit has evolved over the years, from the tight outfit Mrs. Peal wore to the parachute styles in the seventies and eventually to the array of colors and cuts that are available today. This year we are seeing a lot of desert shades, tans, browns, gray and neutrals as a base color for the jumpsuit. There is also an array of color blends that are showing up in patterns and prints, that include the shades of blue combined with varying purple tones. The colors of nature are an easy choice for the jumpsuit, as you can add so many exotic and Native American jewelry accents. The look can change from a day shopping to an evening get together in a snap. Still need a holiday gift that’s a little more personal than a box of chocolates, (not counting chocoholics)? Or got some holiday cash to get what you really want? Shop from these twelve best of 2012 TV shows on DVD and share, relive, or catch up with pop culture’s suspense filled to laugh out loud moments from Game of Thrones to Big Bang Theory. Cheers to beating cabin fever and catching some great TV hits! Heading back to trendy Yaletown for lunch we stopped for the dinning experience that I was looking forward to the most. 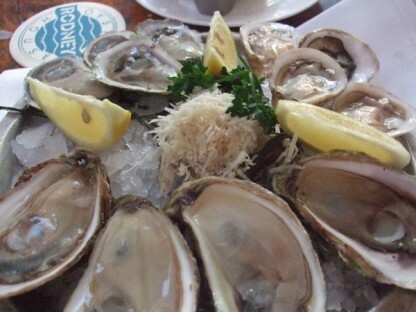 My love for oysters and of fresh raw seafood eateries in general is unexplainable. It is hands down my favorite stuff to eat! So when in a coastal city known for its local sea food products I could not wait to get my hands on some sea critters freshly caught that morning. 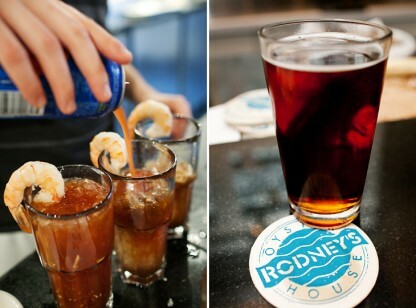 Rodney’s Oyster House was everything an oyster house should be. Small, loud, very casual, with few menu options, and live crustaceans swimming around in a tank. We sat at the bar where ten different types of oysters (mostly local) sat artistically on ice with their labeled names given by discovering fishermen throughout time. I ordered two of each, when I realized my cousin is not an oyster fan, but like any San Franciscan with a true love for oysters, my stomach is always more than well prepared for such an occasion. Here in San Francisco we have mignonette, in Vancouver they have a plethora of vinaigrettes for their oysters that where both delicious and exciting, but left me completely overwhelmed. Like any good server should do, the guys here made sure I tried their oysters the Canadian way. Though I was really impressed by the variety of flavors form so many topping options, I’d rather stick to the way we like to eat our oysters here- a little mignonette with lemon and a dab of Tabasco. To be honest the best way to eat an oyster for true love rather than for dinning opulence is to just eat the little suckers plain. I paired my oysters along with a challenge to our server to make me the perfect Caesar, and OMG!!! This guy, this restaurant, KNOWS how to make one of these National drinks. As I saw him make it in a rushed and insensitive manner, I already knew this was the one I would never forget. After I got my cousin to help me out with the little guys, we ended our meal with a giant bowl of steamed mussels swimming harmoniously as they should be; in a potent smelling white wine, garlic, butter broth that was to die for! Curious about just trying the chowder and their belief it was the best, I could not deny the tasting they offered. I must say (being somewhat of a chowder connoisseur) I have had way better and more east coast authentic chowder here in San Francisco. Nonetheless this place was everything I hoped for. 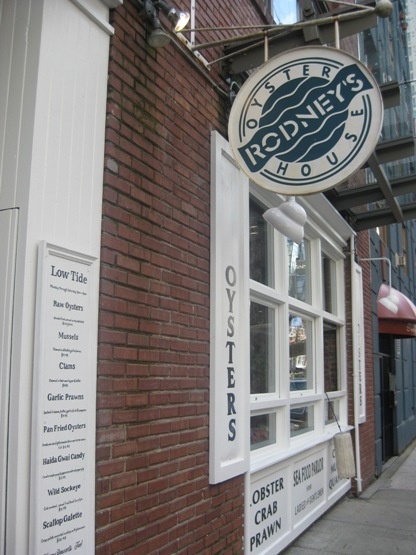 San Francisco oyster lovers, when in Vancouver make sure to check this place out! Image sources: Victoria’s Food Secrets, Sake + Cheese, Eat Drink + Be Merry. Gift the History buff on your list the stuff they want from the History store! From presidential busts to vintage maps, add personality and panache to their collection of memorabilia and grow their library with engaging media. This top ten list features an 1826 giclee map of North America of archival quality to DVDs like America the Story Of Us, sharing the tale of its people, ideas, and events that built this great nation. Shop media and memorabilia celebrating the America from our colonial days to modern day space launches, and give them a piece of a America’s rich history. Celebrate the foodies on your list with the gift of tools, books, DVDs etc. that will pique their curiosity in all things food related, inspire them to try new eats and make their own delicious creations, too! In addition to the books and inspiring movies and television shows, give them the tools and the skills so they can strut their stuff in the kitchen. True Blood junkie? Sci-Fi wonk? Give a gift with a personal touch with these ideas inspired by pop culture, from silly to sporty. Under 50 smackaroos, there’s a great gift for everyone on your list that won’t break the bank. Truly Vampirific? Get them the True Blood 2013 calendar and start their year off on a fangtastic high. And to match the set, add True Blood books to keep them stocked with this set of eight novels including HBO tie-ins to Sookie Stackhouse’s story. If Bon Temps isn’t their thing, there’s always drama in Madison Square Garden thanks to the Knicks and their high-flying stars. Knicks fans will love suiting up in this updated classic hoodie with contrast piping and sporting accessories like head and wrist sweat bands. Or get a trio of Christmas Story gifts. The old man would be proud to sip out of this Christmas Story mug with special leg handle. The whole family can also get into the fun with the Christmas Story party game, ’cause fans know it by heart! And while you’re at it put on the Special Edition of Christmas Story, featuring interviews, trivia, and trailers. The perfect set of gifts for Anglophiles feature Sherlock Holmes, Windsor Castle, and Jane Austen. Gift them these excellent bets: The Best of Sherlock films starring Basil Rathbone in this critically acclaimed series; the yearlong documentary of Windsor castle filmed by the BBC follows the royal family comings and goings; and finally the television adaptation of Austen’s Pride and Prejudice starring Colin Firth and Jennifer Ehle remains a fan favorite. For the sci-fi wonk, the Star Trek faithful will appreciate a daily reminder to Live Long and Prosper and the ability to stay hydrated in any star system. And the similarly geek chic, gift them Rubik’s cube coasters or USB Speaker to add that retro flair of science + coolness. Finally the high stakes bidding of Storage Wars. Doesn’t everyone love treasure hunting? Season One set in Texas encourages big bidding, ya’ll. To complete this gift, be sure to get the T-shirt featuring everyone’s favorite bidder and motorcycle collector, Barry.